While the third-largest employer in Rochester has grown its total workforce by nearly 4,000 employees in the last three years, Wegmans has actually shrunk its Rochester-area workforce by several hundred. Expansion is the company’s overall plan, however, not shrinking. Employees have gone down locally, says Wegmans spokeswoman Jo Natale, due to greater efficiency and seasonal differences. “The reality is the work does change over time and we gain efficiencies,” she said. Natale said the decline is not a signal of any changes coming locally. No stores will close in this area. “The stores that were the busiest in 2015 are still the busiest and we don’t anticipate that changing,” Natale said. Meanwhile, Wegmans is planning to open three stores in 2018 and three more in 2019, all out of the area. Opening days in 2018 have been scheduled for Natick, Mass. ; Chantilly, Va.; and Lancaster, Pa. The three opening in 2019 aren’t designated on the company’s website, which lists 12 locations where stores are planned. “Wegmans now operates in six states, but its heart remains firmly planted in Monroe County,” Natale said. The Rochester area is home to 21 Wegmans supermarkets, as well as the company’s corporate offices, culinary innovation center, warehouse and distribution center. In late January 2018, total employment in the Rochester area stood at 13,133. In June 2015, it was 13,839, a difference of 706. Natale says not to take that drop too seriously or too far. 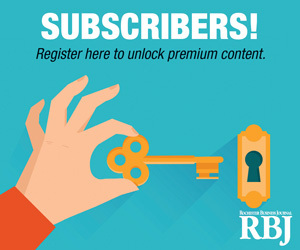 The numbers, while submitted by the company itself for the RBJ 75, are somewhat confusing because they don’t all come from the same month each year. Staffing levels can fluctuate quite a bit over the course of a year, Natale said, because of seasonal variances. Employment is typically lowest in January and much higher in June each year. Wegmans tends not to hire from October to December because it can’t offer training during the holiday buildup. So as attrition happens late in the year, those people aren’t immediately replaced. Indeed, between Jan. 31 and April 5 in the current year, Wegmans gained 70 employees in the Rochester stores and facilities. All over the chain, the company continually finds ways to do things better and more efficiently, Natale said, which can cause some jobs to be eliminated through attrition. One example is a decision to move the creation of some prepared foods out of the stores and to the Wegmans culinary innovation center, she said. “We do that not to change things in the store; we do that to be more consistent, lower costs,” Natale said. Changes in staffing numbers come about as people choose to leave, rather than through any layoffs. “The changes are never dramatic and they happen over time,” Natale said. She described the company as stable in this area and, of course, growing nationally. There may also be some subtraction here and addition elsewhere as seasoned Wegmans employees from the company’s oldest stores—all in the Rochester area—accept transfers to run operations in other states or other parts of New York. But Natale noted that the move to great efficiency takes place throughout Wegmans’ footprint and not just in the Rochester area.